The Billionty-Oneth Geek: 7 Day Fast: No Gaming! No Wrestling~! 7 Day Fast: No Gaming! 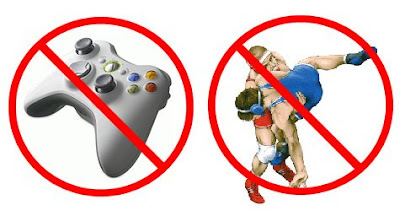 No Wrestling~! Last week my friend told me that she was fasting from television for a week and I thought it interesting because I was thinking about fasting the past few weeks. When I was wondering about what I should fast, food came to mind first. Usually people sacrifice food for a few days, but then I thought, sure I could do without food for a day or two but it just wouldn't have that same oomph that my other poisons would. I'd have to say that the two most time consuming activities these past few months would be gaming and prowrestling. I was weighing out which one of these should I give up for a week. Then today I thought, you know what, God deserves the best of me, I've gotta give up both. So effective at 11:15 pm, Monday May 17th, 2009, I will sacrifice gaming and wrestling for 7 calendar days. For those of you who don't know, since I graduated university last year, I've been job searching. It hasn't been quite successful yet but I remain hopeful. I'm hoping to use this time to concentrate more on the search (although I'm doing all I can at the moment) as well as studying up on the Word for wisdom and to challenge myself for God. Total Hours from above: 46.5 hours! That is kind of scary come to think of it. Although in actuality the number is probably lower, closer to high-20's or low 30's, as usually I'm doing a number of them simultaneously. Regardless of, post-fast I'll have to work on cutting things down. I think it's funny that I'm going to be missing the TNA PPV next weekend, aptly titled Sacrifice. Yes, I'm sacrificing Sacrifice. I'll have to write a follow-up post upon completion. It'll be interesting to see how this goes. Anyhow, take care for now. Later geeks! Oooh, I couldn't give up gaming for a week very best of luck! Thanks Michelle, much appreciated! Day 1 went pretty well, but there were long periods of boredom.